Exclusive new Roger Dubuis timepieces to be showcased at Rocks Fine Jewelry during upcoming collection preview and cocktail party. President of Roger Dubuis North America, Ronald Wolfgang, will be on-hand to present the latest collection of Roger Dubuis timepieces at Rocks Fine Jewelry. Special pieces from Roger Dubuis’ collection will be on display April 17-18. On Friday evening, following the collection preview, Roger Dubuis and Rocks Fine Jewelry will host a private cocktail party at Luxautica, where guests will be able to view pieces from the collection, as well as enjoy the luxury cars on display such as Bugattis, Masteratis, Lamborghinis, and more. Founded in 1995, the ROGER DUBUIS manufacturing independence was achieved in 2003 with its own production of balance-and-spring regulating organs. Located in Meyrin, Geneva, two buildings served to regroup the workshops and services in a single site. This fully virtualized and state-of-the-art industrialization brilliantly endorses the company’s status as an authentic Manufacture. All the movements made in-house are stamped with the prestigious Poinçon de Genève quality hallmark. 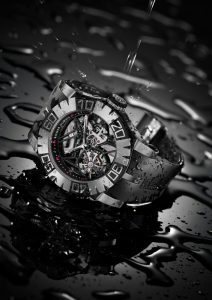 Today, the Manufacture ROGER DUBUIS is a high-performance company which intends to be one of the big players specialized in the luxury goods sector, following a traditional professional culture and creating original, exclusive and avant-garde watches such as Excalibur, KingSquare and EasyDiver collections for instance.